I am so excited. Today was phenomenally productive! I got woken up a couple times in the night, so my sleep quality was low and I wasn’t able to get up early enough to run (changed the alarm). I thought that would be a downer on the day, but it wasn’t enough to keep me down. Today, it felt like something was unlocked. 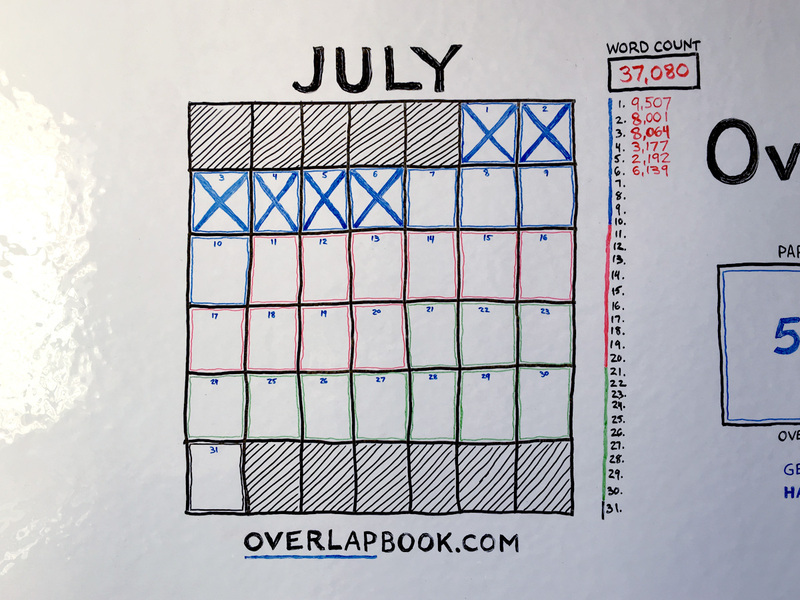 Instead of 8,000 words a day, I changed my goal to: write as many words as I can by 3pm. Well, today I sort of blew past that, breaking 6,000 words. The first half of the day was fairly average to mediocre. I actually only had a little over 3,000 words by 1pm—but something was still slowing me down. I blamed the lack of a run, but I felt like there was something else. The past two days had been very low in terms of writing output (3,000 and 2,000 words respectively), and I really didn’t like that. I knew spending time on the planning was important, but I didn’t feel like it was quite there. Today, I called Cory into my office. Cory does video production at seanwes and he’s a great sounding board. I talked him through the entire book. This took nearly an hour, which hurt a little bit given how precious the time is, but I knew it was important to do. I told him the whole story and showed him the rough chapter outline. I needed to talk through the book with someone who both understands and knows my concepts enough to think at a high level, but is also a target reader for the book (someone who wants to achieve greatness). Cory is the perfect candidate. I walked him through each of the chapters. I knew most of what I wanted Overlap (Part I) to be about, but I wanted to make sure the order made sense to someone else. I needed everything to flow and I also wanted it to set up Curate (Part II) as the natural next step. That hour spent talking with someone who was a candidate for the book and investing in the structure was by far the best investment I could have made. I realized this was the primary reason the past couple of days had felt so aimless and unproductive compared to the start of the project. In the beginning, I had a lot of ambition and I knew how I wanted the book to start. But after the first 30,000 words, I really needed to get a solid idea of where the book was going and how it was going to get there. I really did need to spend these past three days on the big picture and focused on things at a high level. The word count might have been lower, but it was a productive endeavor. I have a love-hate relationship with the word count metric. The word count is an incredible motivator for me. It has also been the sole thing I judge the day’s success by. If I write a lot of words, the day feels like a success. If I don’t write a lot of words, that may have been for a very good reason, but I still feel like the day was more of a failure. I need to remember to define success by putting an X on the calendar. Don’t break the chain. That’s all that matters. Cory and I have this thing we say: “Run until you walk.” It came from some of our very late nights spent cranking out as many as 48 video lessons for a course in one day. We were maybe only a little bit delirious that day. “Run until you walk,” means you go until you simply can’t go any more. “Run until you walk,” Cory said, and so I did. 6,000 words feels so great. It feels like I’m me again. I know where I’m going now. Parts II and III still need more fleshing out when I get to that point, but I have all of Part I, Overlap, mapped out and I’m excited to get everything out of my head onto the page. The path forward feels clear. Today’s word count reflects that clarity. Decide the day before that you are going to have an awesome day tomorrow and you will. Time spent preparing is not wasted. It may take time, but it also saves a lot of time spent heading in the wrong direction. Don’t underestimate the power of having a clear vision and knowing where you’re going.